Welcome to the new year to all the property managers out there! It’s that time of the year when everyone’s figuring out budgets, projects and the biggest needs on their property for the upcoming year. Prioritizing projects is the essence of wise property management, but sometimes it’s hard to know exactly what should come first. Should you get that new area paved? Does an older area need repairs or sealcoating? Are the drainage systems in order? Did potholes sprout over the winter? In terms of paving projects, it’s important to schedule a new year’s consultation with your commercial paving contractor so that you can arrange a wise schedule regarding what needs to be done now and what might be scheduled for next year. Schedule an appointment for a consultation with Espina Paving, one of the top commercial paving contractors in Northern Virginia today. We’ve been serving commercial clients with large-scale commercial, industrial and municipal paving projects since 1976 and we can help you with the following 5 paving project planning tips. Take a tour around all of your paved areas and note areas where you have questions or concerns. 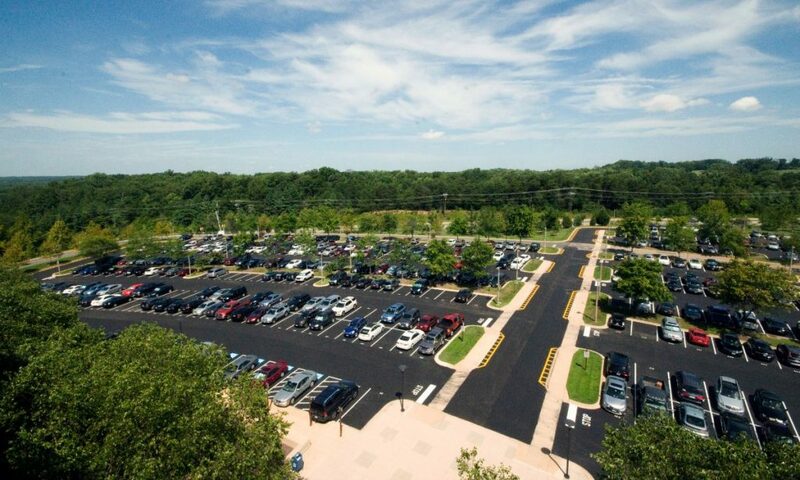 During your consultation, we’ll personally examine your parking lots and roadways with you, discussing your needs, infrastructure and any concerns you have. We’ll also test the asphalt at various locations to measure pavement wear and tear, drainage, thickness, subbase conditions and how well all of these factors work or not. After testing and surveying your pavement, we can help you come up with a strategy to preserve, maintain and improve paved areas on a schedule that works within your budget. After prioritizing which paving improvement jobs are most critical and which can come later on the schedule, establish the budget you’ll have to work with on these projects. Creating a long-term budget and project timeline can help you save money in the long run. By planning essential maintenance and repairs and preventing further damage, you prevent more expensive repairs that might occur without a plan in place. Espina Paving works hard to ensure that your commercial paving projects stay on budget and help you save money in the future too. Planning for preventative maintenance really is the key to protecting your long-term investment in your pavement infrastructure, whether it’s asphalt parking lots and roadways, or concrete walkways. Scheduling necessary maintenance for this new year, as well as looking down the road at essential maintenance for future years is essential. Your parking lots may not need sealcoating this year if you just had it done last year. But scheduling it for the next appropriate year goes a long way toward getting the most decades of life out of your pavement. The same goes for pavement cleaning, drainage maintenance, crack filling, etc. When setting up your schedule for this year and coming years, be sure to put regular pavement inspections down on the calendar. Don’t just try to remember—we know how busy property managers can get and how easy it is to get called away on other matters. Espina Paving recommends picking a date every year in the spring and the fall to do a thorough walk-around of your paved areas to look for spills, cracks, debris, potholes, puddles and other issues. Getting small problems fixed promptly can save your budget from bigger repair bills down the road. Espina Paving has decades of experience working with property managers, helping them protect their paving investment so they can avoid hassles, headaches and large pavement repair bills. 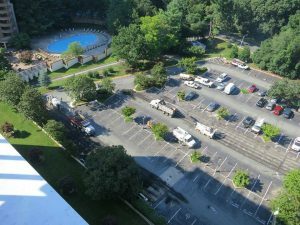 We have the experience, expertise and equipment for big commercial jobs around Northern Virginia, and understand how our unique climate, landscape and property managers’ needs impact those big paving jobs. Call today to schedule a new year’s consultation and we’ll help you get this year off on the right foot! We look forward to hearing from you at (703) 491-9100.